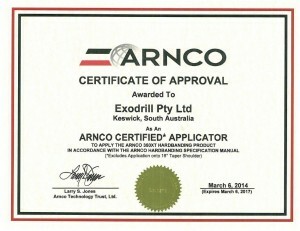 Building on our service lines, ExoDrill are now able to offer certified Hardbanding application on site and have already begun servicing some of our customers. Arnco’s innovative alloy designs combined with parameters that induce optimal alloy transfer during welding work together to produce a smooth, low spatter and high quality finished weld. Our use of Arnco Next Generation Hardbanding provides our customers the industry’s most advanced and innovative hardbanding products.